It's been a never-ending challenge to find old Japanese cars for this series, but (in the months since the readers applied their Stamp-O-Approval to early-80s Japanese DOTS cars) I've been able to find a few of these Late Malaise Toyotas on Alameda's streets. 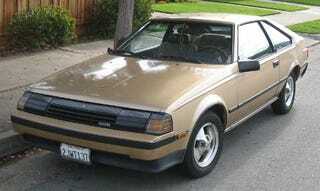 This '84 Celica is somewhat frayed around the edges, but still in solid running condition. What&apos;s The Cutoff Year For Japanese DOTS Cars? This is the high-end GT model, with plenty of mid-1980s attitude (and- most likely- 300,000 miles available in its 22R engine). This car's styling has held up well with the passage of 24 years; even today, it's got the looks to make your robotic alien mailbox say "Nice Car!" The &apos;82 Celica Turns Mailboxes Into Time-Warping Aliens! Back in the day, I recall thinking this rear marker-light treatment looked pretty goofy... and I still think so now. What is the symbol on this ornament supposed to represent? Back when we were looking at a '77 Celica, some commenters felt it was a swan, while others saw a dragon.